When Gisela loses her father at age 8, everything changes. Her evil stepmother forces her into a life of servitude and treats Gisela with spite and hatred. Nothing changes until years later, when she meets the duke’s handsome son again. Valten (introduced in The Fairest Beauty) is wary of women ever since his brother swept his betrothed off her feet. When he meets Gisela, he immediately feels a connection, and she with him. But an evil man bent on revenge is determined to make them both pay. I pretty much loved this book immediately. There were all these links the author made with the characters from her other books. 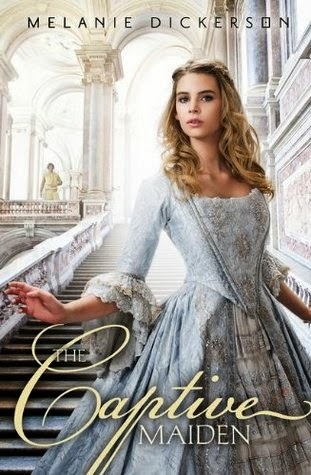 I loved The Healer’s Apprentice, The Merchant’s Daughter, and The Fairest Beauty, and I enjoyed this new installment just as much as the others. Set in Germany 1412, The Captive Maiden is exciting, suspenseful, and absolutely magical. I couldn’t help but get caught in the story and I finished it in one day! Now, let’s talk about the romance! Varten and Gisela were just perfect. I mean, sometimes I wanted to yell at them for being idiots and not just telling each other how they felt. But for the most part, they were perfect. I liked how it wasn’t your typical “boy saves girl” story, I really appreciated Gisela’s bravery and the fact that she did some of the saving as well. This imaginative and inspirational retelling of “Cinderella” makes into a beautiful story of love and faith! I couldn’t put it down. I am really hoping that Melanie Dickerson has more of these fairytales in store for us!